ICC's annual update of the test rankings pushed Pakistan down from number 3 to 6 just before the start of their series against Sri Lanka. For them to go back to number 3, Pakistan had to win the series against Sri Lanka. Something they had not managed to do in the island since 2006. Pakistan won the test series 2-1, a scoreline that could have so easily been 3-0 for Sri Lanka. First innings scores of 138 and 215 in the 2nd and 3rd tests respectively showed how inept Pakistan's batting line up can be. Yet it was two brilliant counter attacks with the bat that resulted in a series win for Pakistan. In the 1st test, they had collapsed to 96-5 after Sri Lanka had posted 300 in the first innings when Asad Shafiq and Sarfraz Ahmed came together. The two Karachi boys turned it on with so much confidence that it was hard to believe that Pakistan had lost their top 5 batsmen for under a 100. Asad and Sarfraz put on 139 runs for the 6th wicket with Sarfraz playing in his usual aggressive fashion. His 96 off only 86 deliveries took the game away from Sri Lanka. Asad continued in his dogged style and added another 101 runs for the 9th wicket with Zulfiqar Babar. That was the first of the two times that Pakistan's batsmen turned it around during the series. The next turnaround was even better. With the series level at 1-1, Pakistan faced a daunting target of 377 and were staring at a series loss. At 13-2 the writing was on the wall and Pakistan's fate as test number 6 seemed certain. Social media was buzzing with criticism. A series that could have gone 3-0 for Pakistan was going to be lost 2-1 said some. Ahmed Shehzad was abused left, right, and center. "YK ka 200 likh lo"
"Buss Younis 100 kar jaye"
It all happened! I have all the messages saved to show the world that believers still exist. Shan and Younis produced a fairy tale performance that made the dreamers smile like never before. It was a performance that could have only come from Pakistan to make sure the non-believers start believing in the magic again. It was a turnaround that was so often orchestrated by Wasim and Waqar in the 90s, but this time it was two batsmen doing it for Pakistan. Shan and Younis added 242 runs for the third wicket in a series defining partnership. Pakistan chased down 377 and won the match by 7 wickets, and the series 2-1. They made it look so easy; as if the target was just 150. Off late, it has become common for Pakistan to create new records with every test series and this was like no other. Both kinds of records, team and individual, were achieved. For Pakistan, this is only the third time in their history that they have successfully chased down a target of over 300 in a test match. It is by far their highest successful chase ever. It is their highest 4th innings total ever. It is the highest target ever achieved in a test in Sri Lanka. It is the 2nd highest target ever achieved in a test in South Asia. It is the 6th highest target ever achieved to win a test match. Sarfraz Ahmed has been a match winner for Pakistan. He was there when Pakistan chased 302 against Sri Lanka in Sharjah in January last year. He was there during Pakistan's historic test series win over Australia. And he is there now. He hasn't been there merely; he has made his presence felt with the bat like no wicketkeeper ever has for Pakistan. 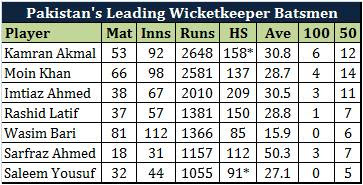 He is already among the only 7 wicketkeepers from Pakistan to score over 1,000 test runs. He has by far the best average among all of them, and at the rate he is going it will not be long before he displaces Kamran Akmal at the top of this list. Sarfraz is not only one of the best in Pakistan, but he is also among the best in the world. He is among the only 3 wicketkeepers in the history of test cricket who have scored over 1,000 runs with an average of over 50. The way Sarfraz' career has shaped up, I will not be surprised if he ends his career as the most successful wicketkeeper batsman ever. If there was ever a partnership that could define "monumental", this would have to be it. At least in modern times. Everyone knows that the 4th innings is the most difficult innings to bat in; to score big in the 4th innings to save a test or to win one is by far the most fulfilling achievement for a batsman. So you can imagine what this 242 means for Pakistan, more so because it came after Pakistan had been reduced to 13-2. In the 4th innings of a test, it is Pakistan's highest partnership ever, it is the highest partnership for the 3rd wicket ever, and it is the highest partnership against Sri Lanka ever. It is the 4th highest and only the 7th 200 run partnership ever in the 4th innings to win a test. With 61 wickets in 10 tests, Yasir Shah has achieved something that no other leg spinner ever did. Neither Shane Warne, nor any of Anil Kumble, Abdul Qadir, Stuart MacGill, or Clarie Grimmett had as many wickets as Yasir has after their first 10 tests. During the series, Yasir became the first bowler from Pakistan to pick up 50 wickets before his 10th test. Yasir managed it in 9 tests breaking the record that was jointly held by the legendary Waqar Younis, Shabbir Ahmed, and Mohammad Asif. Yasir reched his 50 test wickets in lesser time and fewer tests than any bowler in the history of Pakistan's test cricket. He left everyone from Imran Khan to Wasim, Waqar, Qadir, Mushtaq, Saqlain, Shoaib, Asif, and Ajmal behind. Yasir is also one of the only 6 spinners in this world and one of the only 3 leg spinners in this world who managed 50 wickets in 9 tests or less. The only other leg spinners who managed this are Australia's Stuart Macgill and Arthur Mailey. That is some elite company that Yasir is in. How far can Yasir Shah go is anybody's guess, but for Pakistan he has turned out to be a trump card like none other. He has taken over from Saeed Ajmal like no one would have imagined and he has brought leg spin back as a weapon that Pakistan had so dearly missed. He is undoubtedly the best leg spinner in the world at the moment and if he can keep going the way he has started, he will also be remembered as one of the best leg spinners ever to play the game. This was Misbah's 18th test win as captain. He is 4 clear of Imran Khan and Javed Miandad, Pakistan's (former) most successful test captains. Even though Misbah's W/L ratio is less than that of both Imran and Javed and his win % is less than many others like Wasim, Waqar, and Saleem Malik, Misbah has presided over some of Pakistan's most historic and iconic test victories. Some include clean sweeping England when they were ranked number 1, beating Australia in a test series for the first time in 20 years, and now this chase against Sri Lanka. It is not only these victories, which make Misbah Pakistan's most successful test captain, but also his batting. He finished the game off today with a 6 that took him to 4,000 career test runs, 2,992 of which have come as captain of Pakistan. No one has scored as many runs as Misbah has as captain of Pakistan and he is only 8 runs away from becoming the only Pakistani cricketer to score 3,000 test runs as captain. 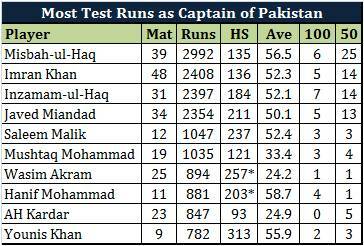 Misbah's test average of 56.45 as captain of Pakistan is second only to that of Hanif Mohammad. Misbah has not only scored lots of runs as Pakistan's captain, he has also scored more runs and more centuries as Pakistan's captain in test wins than anyone else. Yes, even more than Pakistan's biggest match winner ever, Inzamam Ul Haq. He has achieved so much that I am going to dedicate an entire post to him. As I always do after every test series Pakistan plays in. Pakistani cricket team is the most astonishing cricket site of the world. They can change every scenario and situation of the ground. Tey are really amazing and wonderful. Its always wonderful to watch the game of Pakistan cricket team and squad. Saturday, March 18, 2017 This comment has been removed by a blog administrator.